Flamenco is probably Spain's most famous art form (it's certainly a lot less controversial than that other popular Spanish pastime). There are daily flamenco shows in Madrid, Barcelona and Andalusian cities such as Seville, Granada, and Malaga, although many of them are geared towards tourists and it is difficult to know which ones are the good ones. As a rule, if a venue has more than one show per night, the latest one will be the one where the most Spaniards go - and so fewer tourists - and the performance will be adjusted accordingly. Isn't Flamenco Just a Dance? No! There are four distinct elements to flamenco - the guitar playing, the vocals, Flamenco Dancing and the 'palmas' (hand clapping). Out of the four of them, it is the dancing that is most likely to be dropped, if any of them. If it is the dancing that you are most keen on seeing, check that there will actually be some dancing at the show. Normally the performers will be listed on the flyer - 'Baile' is the dancer, 'Cante' is the singer, and 'Guitarra' is the guitarist. 99% of tourist-orientated shows will have all three. The flowery dresses seen in the tourist brochures are only for very special occasions (and touristy performances); much of the time the dancers are dressed in black. And I have only ever seen a flamenco dancer use castanets once! Why is it Called 'Flamenco'? Some have argued that the music was given this name because the dancing resembled the movement of a flamingo, although this is unlikely. The word 'flamenco' also means 'Flemish' (the people of the Dutch-speaking side of Belgium) and it has been said that the music may have some of its roots in that part of Europe. There is a third theory which is popular, which says that it comes from the Arabic 'felag mengu' (sometimes spelt 'fellah mengu') which means 'peasants without land'. It is quite possible that this was the original form of the word and it was later corrupted to its present form for the reasons explained above. What Kind of Show Do You Want to See? One question is whether you want to see flamenco in Seville at its 'best' or at its most 'authentic'. What's the difference? Well, imagine seeing BB King at a huge sports stadium. It may well be the best blues concert you ever see, but is it 'authentic'? On the other hand, a smokey blues bar in the backstreets of New Orleans is likely to have more authentic blues, but it may not be up to the standard of BB King's stadium gig. You will get some dismissive snobbery from so-called flamenco fans who say that the big venues like El Arenal in Seville are 'for tourists'. The truth is, real flamenco fans would go to such venues every night if they could afford it because this is where the best artists perform: because tourists bring in money. If Jay-Z and Beyonce can complain about dwindling artist revenue in music, imagine what it's like for flamenco artists? It's no wonder the best artists perform at such shows. 'Tablaos' are generally speaking where you'll find a very formal and excellent performance, whereas the flamenco bars will normally be a bit more informal and more 'authentic'. A flamenco festival is the best place to see flamenco in Spain. While some of the best stars tend to work at the tourist-focussed tablaos, the real superstars are touring the world and are only able to perform in Spain at the biggest festivals. Madrid: Suma Flamenca throughout June. Cordoba: Guitar Festival of Cordoba first half of July. Malaga: Feria de Malaga in August. Granada: Granada's International Festival of Music and Dance late June or early July. Madrid is not the traditional home of flamenco, but as the capital city it, of course, attracts the best performers as this is where the money is. As Madrid is less famous for flamenco, its flamenco venues are not marketed so strongly towards tourists. Any bar called 'tablao de something' is likely to be a flamenco venue. One of the most famous flamenco tablaos in Spain. A less famous (but still great) venue Madrid. Beautiful tablao in the style of Granada's Alhambra. An excellent flamenco tablao between Atocha station and Sol. Another well-known flamenco tablao in Madrid. One of the most popular flamenco venues in Spain, a little less formal than some. Though Barcelona is not historically associated with flamenco, the city's cosmopolitan appeal has attracted flamenco artists from Andalusia to Catalonia. 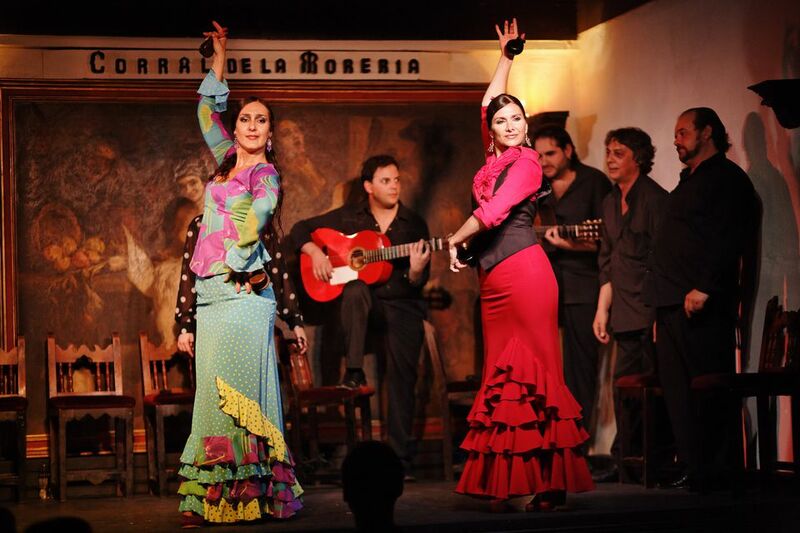 Some of the biggest flamenco shows now take place in Barcelona. Very central flamenco show, right on the Ramblas. The imaginatively titled Opera and Flamenco show in Barcelona is, not that surprisingly, a show that combines opera and flamenco. A unique mix of the high arts that you won't see anywhere else, but don't expect to see 'classic' flamenco. Flamenco show in the Poble Espanyol on Montjuic, which is a very touristy spot to have a show. Avda. Marqués de Comillas s/n. Poble Espanyol de Montjuïc. Apparently, one of the oldest flamenco 'tablaos' in Barcelona, opening its doors in 1963. One of the best places in Spain to see top quality flamenco. Also known as El Palacio del Embrujo. One of the cheapest of the good flamenco shows in Seville. Also in the Santa Cruz area. Granada is another great city for flamenco. Check out a show in the Alhambra if there happens to a concert while you're in town: I saw a 'flamenco ballet' there and it was fantastic. Flamenco shows in the Sacromonte caves can be found at venues such as Cuevas los Tarantos, Cueva La Rocio, Museo de la Zambra and Venta El Gallo. One of the best low-key flamenco shows in Granada. Malaga: Taberna Flamenca Tocayos raucous youth-oriented show that proves flamenco is not a dead art form. Often more 'flamenquito' (flamenco pop) than traditional flamenco. Kelipe is another good option.